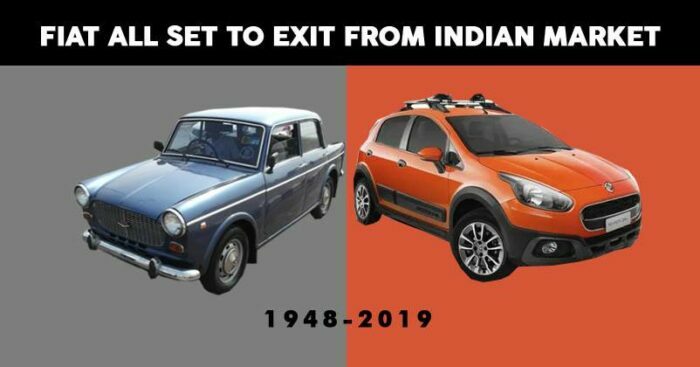 Sad news for car lovers in India as one of the most popular car makers in the world- Fiat has decided to say goodbye to Indian market. Currently, Fiat only sells Linea, Grand Punto, Avventura and Abarth Punto in the Indian market and none of these vehicles complies with the future safety and emission rules. Fiat is not so popular in India and its sales have decreased badly. From December 2017 to November 2018, Fiat sold only 101 units of its vehicles and the company has no plans to launch upgraded versions of the cars that will comply with the expected norms. The Fiat Linea and the Punto have been on sale in India for a long time now, and both the vehicles have not received any major update to keep them fresh in the market. Fiat has ordered its dealers to sell off the non-ABS inventory as soon as possible in the market. It should be noted that ABS will become mandatory in the cars from 1st April 2019. However, the major update will come in October 2019 when the new BNVSAP rules get implemented in the market. That’s the time when the Fiat is expected to officially cease their operations in India. India will get the new Bharat New Vehicle Safety Assesment Program (BNVSAP) from October 2019. According to the ACI report, none of the Fiat vehicles can meet the minimum safety requirement. Also, in 2020, the more stringent BS-VI emission norms will be implemented in the Indian market. Note that this is the 2nd major brand exit from the Indian market in a short time. From 1st January 2018, General Motors’ Chevrolet brand decided to leave the market after the sales of its vehicles were extremely low in recent times.